I just got back from a fabulous week-long vacation on Cape Cod! My family used to go every year, but we haven't been since 2006. It is so much fun to relax on the beach and generally do whatever you please. Of course, trying out new restaurants is a must. I think we went out for ice cream every night we were there. Absolutely no counting points on vacation for me! Even though I enjoy everything vacation has to offer, getting back to a normal eating pattern after vacation feels really good, and this is exactly what I wanted to do with this recipe. It is packed with fiber from beans and vegetables and protein from the quinoa. It is also meatless, so perfect for vegetarians or Meatless Monday. My recommendation is to prep everything before you get started. There are a fair amount of steps involved in making this, but it does move fairly quickly. 1. Heat oven to 400 degrees F; toss sweet potato with cumin, chili powder and 2 tablespoons olive oil and roast for about 10 minutes. Make sure to check to make sure the potatoes are not burning. Remove sweet potatoes and set aside; turn oven down to 375 degrees F.
2. Cook quinoa in about 1 cup water for about 15 minutes; drain and set aside. 3. Meanwhile, heat remaining 2 tablespoons olive oil in a skillet; add onion and saute until onion is translucent, about 4-6 minutes; add jalapeño and garlic and cook until fragrant, about 1-2 minutes longer. 3. Add black beans and corn and cook until heated through, about 3-5 minutes; add quinoa, cilantro and lime juice and cook about 2-3 minutes longer. Season with salt and pepper to taste. 4. Stuff the peppers by adding the quinoa mixture and sprinkle an even amount of cheese on top; bake for about 30 minutes until cheese is melted and pepper have softened. These look delicious. We try to go to Maine every summer (and we get ice cream most every night too!) Thank you for sharing this recipe! I'm hosting a giveaway on my blog (for one of Ryan's necklaces) and I'd love for you to visit. I hope you are doing well, my friend! Cape Cod is so beautiful and you are right - ice cream on vacation is a must, daily! : ) This is just the dish for after a trip. Glad you had fun on vacation. 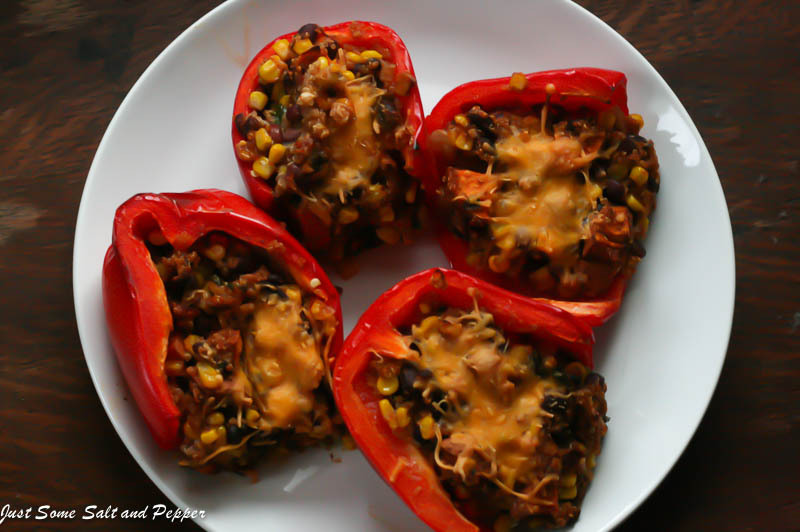 The stuffed peppers look amazing. Calories down count on vacation in my opinion! But it is always fun to get back to homemade cooking after it's over. 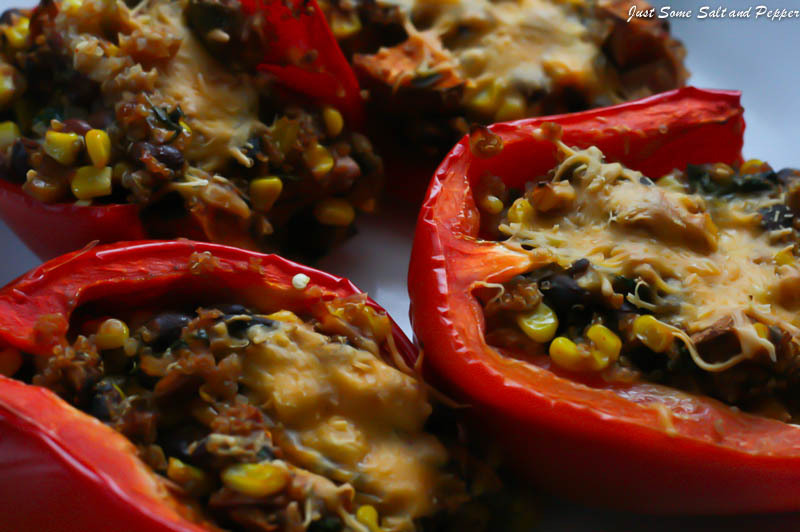 These stuffed peppers are so full of awesome flavor! Oh these look amazing! There are a lot of ingredients but that just means more flavor! It actually looks super easy to pull together. I can't wait to try it! I forwarded it on to my brother too who has been looking for more creative ways to use quinoa! 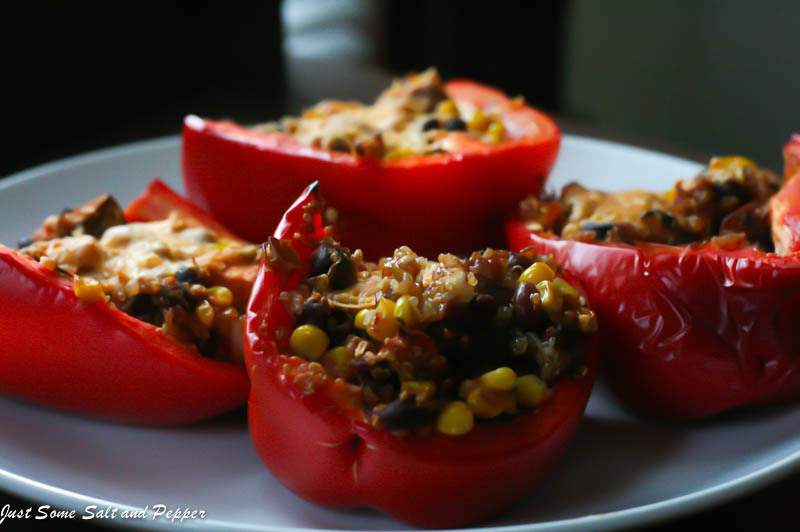 I have been craving some stuffed bell peppers! You totally read my mind! I love stuffed peppers, these look great! 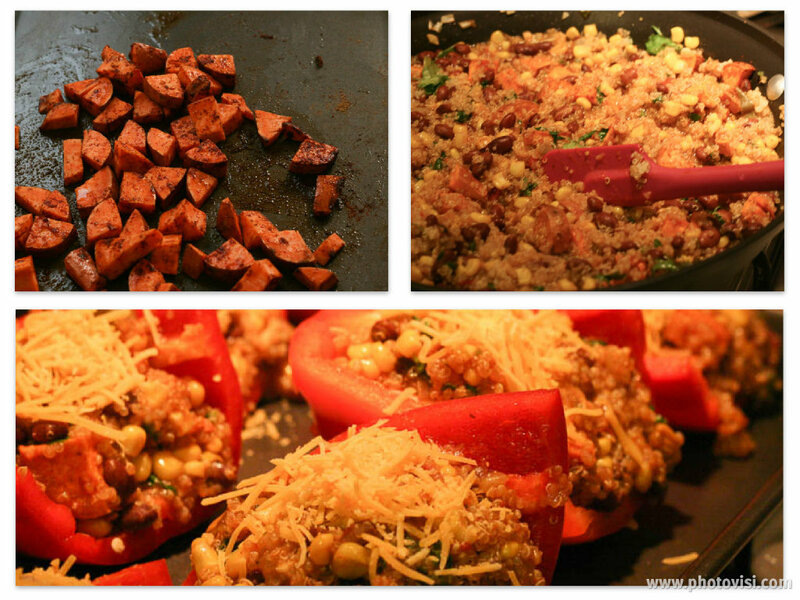 I am trying this one for sure too :-) I love quinoa and I haven't made stuffed peppers in for ever. Pining this one for sure!! I will be perfectly honest. At one point in my life I would have seen those bell peppers and run, not walked away. Then one day a friend INSISTED they are not the same as the vile green peppers I detest. Changed my life. Opened doors. Favorite sauce uses them. So...LOVE this! The Individuals and Firms are always looking for trustable website for their Internet Marketing Campaign buying usa facebook likes.